voting in Cameroon (file photo). These three leaders have something in common, however, that distinguishes them from Paul Biya. Bashir, Afwerki, and Museveni came to power amid civil conflict, converting military victory in to wins at the ballot box. The staying power of leaders emerging during civil conflict is well documented and can be understood, given the need for security in any country. What is difficult to understand is the tenacity of a leader like Paul Biya, who came to power "by accident" when Cameroon's first post-independence leader, Ahmadou Ahidjo resigned.. In 1982, Biya was propelled from his role as a politically-appointed prime minister to head of state and has maintained the position ever since. His staying power in the face of disintegrating material and security conditions in the country challenges the legitimacy of electoral processes and underscores the weaknesses of what analysts call "procedural democracies". In addition to his advanced age, Biya's competence has been under scrutiny in recent years – including the curious fact that he spends a significant time outside the country on personal business rather than attending to affairs of the state. To understand the dynamics at play in Cameroon's recent election, one needs to review the historical record and analyze the context in which Paul Biya's leadership emerged. While Cameroon has never been engulfed in full-blown civil war, its independence was not without bloodshed and rebellion. In the leadup to independence, the Union des Populations Camerounaises (UPC) emerged as a vibrant political force that challenged Ahidjo, the French colonial administration's choice of leader. Ahidjo, at the time a provincial governor, used the repressive apparatus of the state to quell the momentum of the UPC, outlawing the party and sending its members into hiding. Given the linguistic divisions within the country and bifurcated colonial rule, the UPC sought refuge in Anglophone regions where their presence was more easily hidden. The ensuing guerilla warfare between UPC maquisards, colonial security forces, and local people in the Anglophone region has left deep social divisions within border communities. Beginning under colonial administration and perpetuated under both the Ahidjo and Biya regimes, the Cameroonian state has repeatedly deployed violence to quell dissent. Following a close call during the country's first multiparty elections in 1992, during which Biya won a slim majority of 40 percent against the Social Democratic Front's 36 percent, the Biya regime undertook a systematic dismantling of constitutional provisions meant to enshrine political transition. In 1997, Biya's announced intention to extend the presidential term from five to seven years generated a wave of political activism by opposition leaders and civil society actors. The unrest was repressed in what came to be known as villes mortes or "ghost towns ". History repeated itself in February 2008 when social protests spread across Cameroon's major cities in opposition to rising food and fuel costs and a proposed constitutional amendment removing presidential term limits. Unlike the "hunger strikes" that shook West African countries such as Burkina Faso, Senegal and Côte d'Ivoire during the same period, the political factor triggered the popular uprising in Cameroon. Demonstrations were met with renewed violence from police and security forces. Those critical of the government were arrested and convicted for their role in fomenting popular resistance. Similarly, this month's elections unfolded in a context of heightened insecurity and state repression. Two conflicts simmered in the background of the electoral contest. The first was in the Northern region, where Boko Haram has been active for several years and terrorism suspects and their communities have been severely repressed by government forces, who have deployed methods including extra-judicial killings and arbitrary detentions. The second was in the North West and South West regions, which began when Anglophone lawyers and teachers held peaceful protests decrying the marginalization of the regions. The severe repression of these protests by security forces, including a government-imposed Internet blackout, attracted global attention. What began as a peaceful mobilization has since transformed into a rebellion with an estimated 1,000 armed separatists active, leading to the deaths of up to 175 security forces and rendering the regions ungovernable. Schools have been closed for over a year and an estimated 250,000 people have been internally displaced since 2016. Ultimately, this insecurity may have boosted Biya's electoral performance. While the Anglophone insurgency has been led by a minority of fringe groups, it has further marginalized the region, decreasing the vote share for traditional opposition parties such as the Social Democratic Front. Meanwhile, the general context of civil unrest tends to reinforce support for the incumbent in the hopes that continuity will lead to the reestablishment of order. The systematic and violent repression of dissent has successfully undermined political participation and created a culture of fear that prevented many Cameroonians from openly expressing their political opinions or registering to vote. This month's election had the lowest voter turn-out since the introduction of multi-party elections in 1992. Official records indicate that only 6.5 million Cameroonians were registered, of whom an estimated 40 percent of registered voters participated. 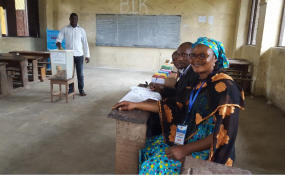 While many international observers interpreted this low turnout as an indication of widespread political apathy, the realities on the ground in Cameroon point to the emergence of adaptive forms of political engagement. In a context where routine political processes have lost their legitimacy and electoral outcomes are a foregone conclusion, new forms of activism emerge to contest autocracy. Accordingly, social media became the primary platform for information and political debate before and after the election. Sixty percent of registered voters were under the age of 26 in Cameroon, meaning that they were born 10 years into the Biya regime and have known no other political leader. In response to this demographic weight, the traditional opposition party, the Social Democratic Front, selected a younger party member to run as presidential candidate, Joshua Osih. The rapid rise of another new, young leader, Cabral Libi, also reflected a new energy and dynamism in a political landscape long dominated by an old guard of political elites dating back to the early 1980s. Initiatives such as Cabral Libi's "11 million registration" operation in January 2018 mobilized political participation among Cameroonian youth and revived public interest in politics. Unfortunately, this mobilization came too late in the game and did not result in massive voter turnout. For the second time since 1992, the opposition unanimously contested election results, citing voter intimidation and fraud across regions and particularly in opposition strongholds. With the dismissal of all 18 petitions filed before the constitutional court, attempts at legal recourse have failed. Ultimately, the hegemonic control of the Biya regime across the military, security, judicial, and legislative organs of the state deprived institutions of their ability to counteract fraud and corruption in the electoral process. Presidential elections continue to present important tests of democratic consolidation in Africa, particularly in countries emerging from authoritarian rule or conflict. Despite the controversies and contestation that precede or follow elections, peaceful transitions of power in countries like Burkina Faso, The Gambia, Angola and Zimbabwe have strengthened confidence in the transformative power of electoral contests and popular participation. Recent transitions in countries where political observers had all but lost hope of successful transfers of power should provide an inkling of what the future may hold for Cameroon. In Burkina Faso, popular mobilization in the context of defections from the ruling party paved the way for the electoral defeat of 33-year incumbent Blaise Compaore. In The Gambia, the traditional democratic process took observers by surprise when Yahya Jammeh was ousted through the ballot. In Angola and Zimbabwe, long-established revolutionary leaders were removed from office through a combination of popular protest and intervention by the armed forces. Today, none of these avenues is apparent in Cameroon. But given that Biya has weak popular support and is presiding over a disintegrating state, it is unlikely that Cameroonians will wait idly until the next election in seven years' time. If protests in recent months are any indication, Cameroonians have demonstrated their dissatisfaction with political leadership and their willingness to risk their personal security to raise the visibility of their country's malaise. In conclusion, the conduct of this election has exposed the fraudulent nature of the political game in Cameroon and lifted the veil of opacity presented by the Biya regime. Despite consistent repression of dissent, Cameroonians mobilized on social media to denounce breaches in the electoral process. While security forces prevented the organization of formal demonstrations, civil society and the media took personal risks to decry violations. The unprecedented mobilization that has emerged may provide the basis for more sustained political engagement and voting in the future. Despite recent tensions across linguistic divides, a portion of the Cameroonian population, let by youth and the Diaspora, came together to reject an electoral process that was rigged from the start. The opposition needs to sustain this momentum in the run-up to parliamentary and local elections in early 2019 to secure electoral victories and provide the basis for political counterweights alongside the dominant regime. AllAfrica publishes around 700 reports a day from more than 140 news organizations (/list/publisher/editorial/editorial/type/pub.html) and over 500 other institutions and individuals (/list/publisher/editorial/editorial/type/reg.html), representing a diversity of positions on every topic. We publish news and views ranging from vigorous opponents of governments to government publications and spokespersons. Publishers named above each report are responsible for their own content, which AllAfrica does not have the legal right to edit or correct. Articles and commentaries that identify allAfrica.com as the publisher are produced or commissioned by AllAfrica (/inhouse/). To address comments or complaints, please Contact us (/misc/forms/general.html).